Bob Warters: I am installing a basketball goal in my driveway. My pole has a 10″ diameter flange on the bottom (9″ bolt hole diameter) with six holes for ½” anchors. I intend to use ½” stainless allthread (threaded rod) for the anchor bolts. 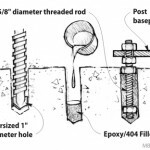 If I drill 9/16″ holes in the concrete 3½” deep and use your system to fix the threaded rod to the concrete, how much tension would you estimate the rods would hold? The concrete is about a year old, it’s 4″ thick and has ½” rebar on one foot centers. Brian Knight: A safe number to use for your calculations will be 1000 psi. In limited testing, we got failure at 1490 psi so 1000 psi will give you a safety factor. Each of the 9/16″ holes you drill will have 6.2 square inches of surface area so each hole can provide 6,200 lb of holding force. You can do the rest of the arithmetic. If some one hangs from the rim, you get quite a lever arm. If you need more holding power, increase the diameter of the hole. If you drill a large enough hole, the bolt will break before the concrete fails. Bob Warters: You said that a 9/16″ hole with 6.2 sq inches of area can provide 6,200 lb of holding force. I assume that refers to the epoxy/allthread joint, not to the concrete/epoxy joint and the 1,000-pound recommendation is based on the strength of the concrete. Therefore, if I use a ¾” diameter hole (8.2 inches square), I can get about 33% more overall strength. Should I use some filler or just the 105/205 epoxy? Do I need to deform the allthread that goes into the epoxy or will the normal threads develop adequate strength? Brian Knight: Use 404 High-Density Filler in the epoxy if there is a creep load. This filler helps to reinforce the neat resin where there is a low load of continuous duration. If you do use filler, wet the hole with neat epoxy before adding the thickened mixture. This will improve adhesion to the concrete. You do not need to deform the threaded rod. There is plenty of surface area available in the threads. When you install the studs, coat the threads with epoxy to prevent trapping air. Brian Warters: Thank you for your support. I have enclosed two photos of the finished project. I drilled 1″ diameter holes 3½” deep in the concrete and followed your directions in setting the six stainless steel 5/8″ diameter studs. I used the 404 filler, but I wet all surfaces with neat epoxy first. The pole is 4″ schedule 40 steel pipe and all joints are welded. After fabrication, I had the whole apparatus hot dip galvanized. 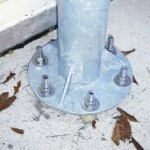 The base of the post shows the six 5/8″ thread rods glued into the concrete driveway. The new basketball goal stands ready for action. See Brian’s article, Testing bolts bonded into concrete, for a look at the process we sometimes go through to respond to a technical question.